Our next monthly meeting we will be showing an educational video entitled Orchid Care Basics: Mastering the Art of Growing Orchids at Home. 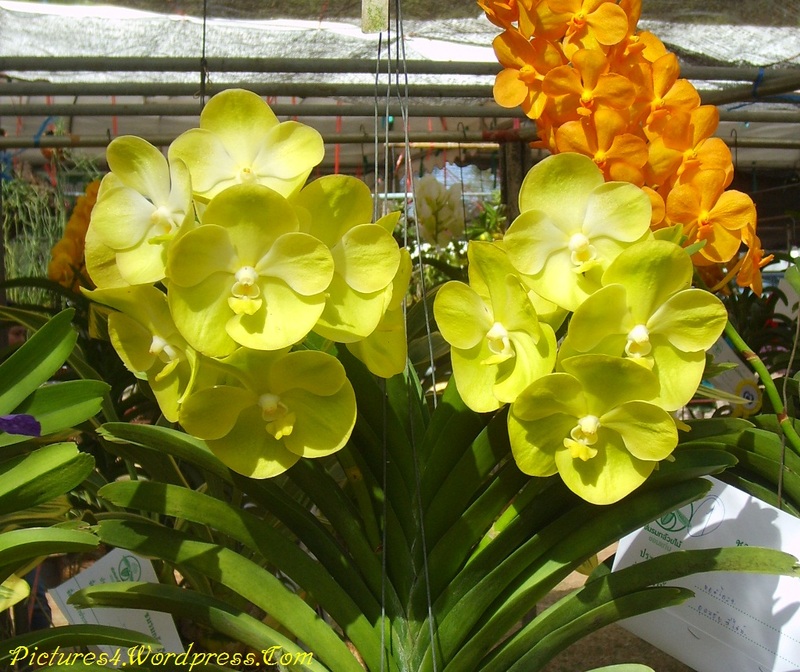 The host of our program is Mr. Mark S. Lee, a well-known Orchid Grower and expert. Mr. Lee discusses many aspects of growing including light requirements, watering and feeding techniques, repotting, selecting the proper potting mix, managing pests and disease and much, much more. It is a well done program and whether you are just getting started growing or have been growing orchids for years, everyone will learn something. Pam Aitchison will also be giving us a virtual tour through our very own website: sfvos.com. Pam will demonstrate all the features of the website including orchid care, culture sheets, links, as well as show you how to find instructional videos on YouTube. Please join us for our next SFVOS monthly meeting. It should be very interesting and informative. Why won’t your orchid bloom? 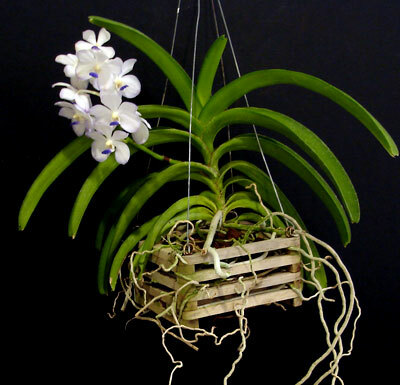 Like all plants, orchids require sufficient light in order to produce flowers. Insufficient light is the most common cause of failure to re-bloom your orchid. Leaf color indicates if the amount of light is adequate. The lus, rich, dark green of most houseplants is not desirable in orchid leaves. A grassy green color (light or medium green with yellowish tones) means the plant is receiving sufficient light to bloom. 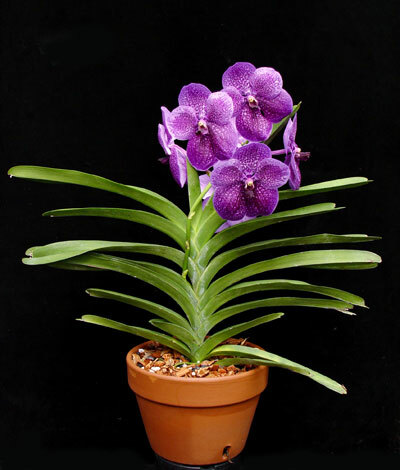 Bryce Augustine will be our speaker for the San Fernando Valley Orchid Society meeting on Wednesday, October 2nd, 2013. Bryce is a long time member of the Santa Barbara Orchid society and an American Orchid Society judge. He owns and operates Monsoon Flora Orchids (monsoonorchids.com), which he established in 1991 and where he produces Paphs and Phrags in flasks, compots and seedlings. He is a 20-year veteran of the American Orchid Society judging system as an accredited AOS judge and brought AOS judging to the central coast in April 2008 by creating a new Judging site in Santa Barbara where he served as its chairman for two years. His presentations are always fun and informative and this coming meeting will be no exception. He will cover many different aspects of Orchids, covering how propagation from seedpods, rainforests, and your own backyard jungle are interrelated. If you were unable to attend the July meeting at the Malibu Orchid Society, you missed a real treat. I went to that meeting, and learned a great deal. He had a great PowerPoint presentation and a live demonstration. After the meeting, I asked Mr. Augustine if he would come and talk to our group, and he graciously agreed. He also brought some great items for the POT. Some were “compots” of many small plants in a single pot. Mark your calendars so won’t miss this fabulous speaker! Applications for smart phones, or “apps” as they are most often referred to, are changing the way we interact with our world on a daily basis. Now there are Orchid “apps” for smart phones for Orchid lovers and/or growers which can help you keep track of all the orchids in your collections. One increasingly popular “app” for the iPhone is the Orchid Notebook. It helps you keep records on your orchids, their names, their appearance, and it offers helpful hints and tricks on how to grow them. Orchid Notebook is easy to use. Just type in the name or number of the Orchid, take a picture with your phone and the entire orchid collection appears on your phone. Adding, deleting and updating your plants is easy. Orchid Notebook shows a running total of the plants in your collection for a quick reference. This is particularly helpful when shopping for Orchids at shows and nurseries. The app offers fairly accurate culture information for the most popular Orchid types including Cattleya, Dendrobium, Oncidium, Paphiopedilum, and Phalaenopsis. The Orchid Notebook also offers information for uncommon types of orchids such as Brassavola, Encyclia, Phragmepedium, and Vanilla. The Orchid Notebook includes sample pictures that are most helpful. 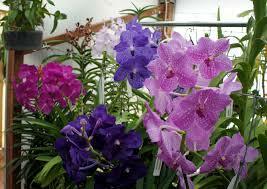 It does not yet contain information about Cymbidium, Miltonia, or Vanda. It is not a perfect app by any means, but it is a step in the right direction. No doubt, future versions of Orchid Notebook and other Orchid apps will follow that hopefully will be more full featured that this one. One noted problem with this app, is that important botanical terms such as ‘species’, ‘hybrid’, and ‘variety’ are used interchangeably, even though their meanings are entirely different. We hope that if enough Orchid Hobbyists comment on this app the authors will get the message and consult real orchid experts to help work out all the bugs of this program. In the near future, as new orchid applications hit the market, hobbyists will have many more options available to enhance their orchid growing experience. The ‘free’ version of Orchid Notebook allows for five entries of an orchid collection and is just to allow you to try the app before you buy. The full version of Orchid Notebook is only $2.99. It is a shame that it is not yet available for the Android world, but if you have an iPhone this is still a good choice for the casual grower or someone just getting into orchids. PLEASE COME AND JOIN US. IT’S EDUCATIONAL AND FUN. We meet on the first Wednesday of every month at 6:45 pm. From the east: Take the 101 (Ventura Fwy) heading west, and exit at Hayvenhurst Avenue. Turn left on to Hayvenhurst, and immediately get into the right lane. Turn right on Magnolia Blvd. Our parking lot is on the right hand side of the street. Park your car and walk west through the garden plots to the main building. From the west: Take the 101 (Ventura Fwy) heading east, and exit at Balboa Blvd. Turn right on to Balboa. Continue southbound for 1/2 mile, and get into the left lane. Turn left on Magnolia Blvd. Proceed about 1/2 mile to the Sepulveda Garden Center. The parking lot will be on your left side. Turn left into the parking lot. Park and then walk west along the sidewalk, thr0ugh the garden plots to the main building. MEETING TIMES: The doors open at 6:45 pm for refreshments and socializing. Our meetings start at 7:15pm. The meetings generally last about two hours. Restrooms are available. PROGRAM: Each month we have an informative program presented by a guest speaker on some facet of the Orchid world. Our speakers are Orchid Experts that give us valuable tips and tricks. It’s always interesting and informative. CULTURE SESSIONS: Culture sessions often precede the monthly meetings, offering an opportunity for hands on instruction on the practical aspects of orchid culture. MEMBER’S PLANT FORUM: Our members are encouraged to exhibit their blooming plants. Outstanding plants are selected for ribbon awards. Each member who brings plants will receive one ticket for the P.O.T. Raffle. A complete set of rules for ribbon judging is available at the meetings. P.O.T. (Plant Opportunity Table): Plants are generally provided by our guest speakers and by our membership. This is truly a great opportunity to increase your orchid collection at little cost and an opportunity to support the Society. One ticket is given to each member who wears their name badge for the first drawing and one ticket is given to each member who brings plants to display at the Member’s Plant Forum for the second drawing. Proceeds from the P.O.T. help defray our costs for speakers and programs. AUGUST: NO AUGUST MEETING THIS YEAR. DECEMBER: Our Annual Holiday Potluck Party. During the year the Society Members participate in a numbers of other activities such as Orchid Shows, Greenhouse tours, picnics, etc. Our beautiful full-color monthly SFVOS Newsletters keeps members informed on both upcoming meetings and other Society events. We also publish news and information about all the happenings in the Orchid world. 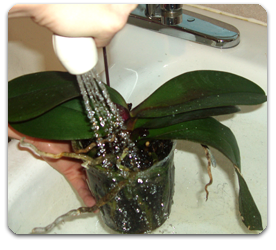 Each month there are tips and tricks and other helpful information on caring for your orchids. Newsletter is available via email, and by snail mail. The Newsletter is included with your annual membership dues ($25.00/yr). There are 12 issues each year. In alphabetical order, rotating throughout the year, Members are asked to bring refreshments to the monthly meetings. Members may also bring refreshments at any time, even when it’s not their turn.